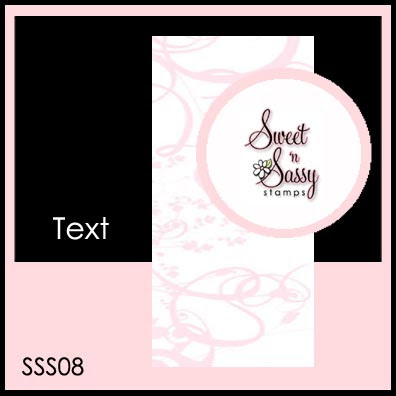 Are you ready for another Sweet -n Sassy challenge? Well, Saturday has arrived, and with that comes another challenge from the Sweet Stop. This is the sketch for Saturday, June 13th, and what a sketch it is! Oh did I ever have fun with this one!! Be sure to check out all the samples from the SNSS DT, because it looks like they enjoyed this one too! 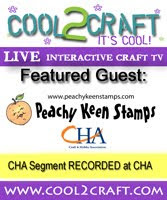 I knew I had put back some of the Stampin' Up! 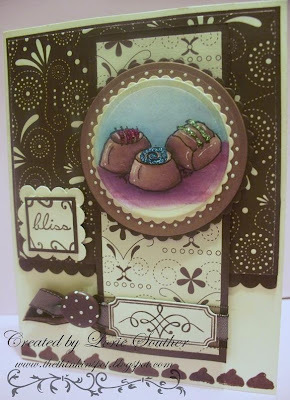 Au Chocolate paper, which retired quite some time ago, and when I saw this Chocoholic stamp set from Sweet -n Sassy Stamps, I knew exactly where my paper stash was going. I have to say that I absolutely LOVE this stamp set!! It has some of the most wonderful sentiments, as well as a variety of chocolate goodies to color. What a delicious treat this would be for anyone's collection, but it's a MUST HAVE for the chocoholic!! I put my neglected nesties to good use on this card, and since I used scallops to frame the image, I wanted to follow through with more around the sentiment and below the designer paper. The polka dots around the image and on the brad were added by me with a white gel pen. Thank you so much for stopping by today. It is my hope that you will find something here to bring you joy, and inspire your creativity. Please come back soon, and have a blessed day! There are so many more that I could share this with, but I'm going to save some of those friends for the other sisters to pass along to. Please know that I look forward to all of your comments, and am touched and humbled by your kind words and support. Our cirle of friendships keeps growing, and has become such a blessing in my life! You are all beautiful people. Isn't it amazing that I know that even when we've never met personally, and in some cases I've never seen a picture. I know it because of your beautiful, kind and generous souls! 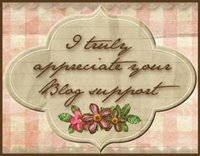 Love and hugs to you all, along with my sincere gratitude for all your support and encouragement! Have a blessed day full of Happy Stampin'!! Wow!!! This is beautiful!!!! I love your design...love the DP (too bad it retired!) and your coloring rocks as always! AWwww, thanks, my Dear! How sweet...just like your card!! Yummers...those candies look real! I'm hoarding this DP myself, so I'm glad to see you bring it out to play! Lorie, this card is yummy!! Beautiful coloring and the DP is a perfect wrapping for the delicious chocolate. This is a yummy card...it doesn't happen to be a srcatch and sniff does it? LOL! AND thank you dear for the sweet award and your support too. This is just delicious :), love the coloring and the dp. Mmmmmmm.... yummy card! I love how you coloured your chocolates - I can almost taste them! This card does look so yummy! You have done these chocolates justice as stamps to make make them look so edible! I love the whole card but your coloring is fabulous! OMGosh, I'm starting to scare myself! How did I miss all of these recent posts??? You are such an angel, Lorie! Thank you so much for honoring me. I'm ever so grateful for you in my life. You are a shining example of love and faith. I'm drooling over this card! Could be hormones, but this card is calling my name and awakened a serious chocolate craving! LOL! LOVE the DP on this baby, and how you jazzed up your nesties! Awesome coloring and love the glitz on the candies! You rocked this sketch and it is totally TDF!